As the sun sets earlier each day and summer approaches its end, we feel pressed to squeeze the most out of its remaining days. It`s now dark enough at night to see the aurora again. The night-time temperatures have begun to drop to single digits. Lovers of northern summers – inarguably the best summers on the planet – alternate between wistfulness and denial that another one is ending. August feels less frenetic, somewhat more laid-back, perhaps also because we’re tuckered out from trying to keep up with all of the activities of earlier months. 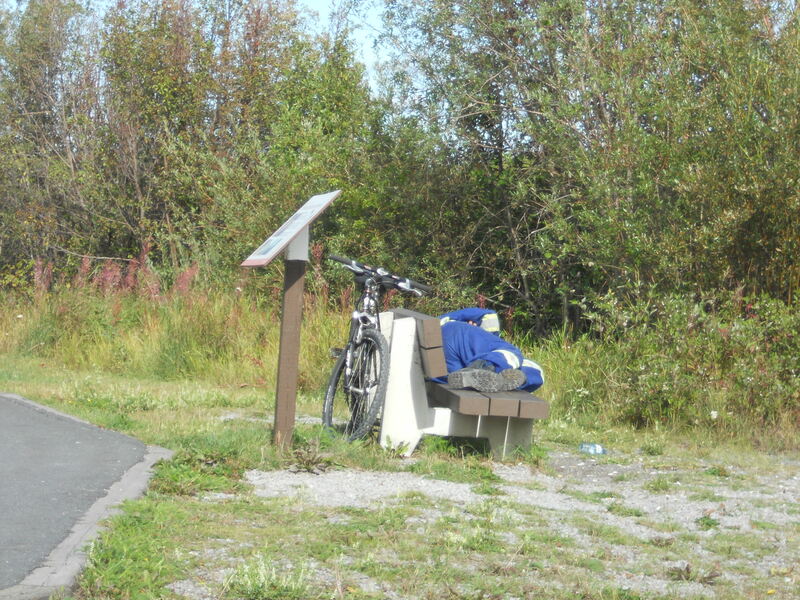 An impromptu open-air siesta is always a good idea during the summer, but evidently August is when there is time for it, or more likely, when it`s not considered too hot to do it. The community gardeners tend to slow down (a bit) too – after a season of back-breaking cultivation. Now they must reap the results of their labour before the frost appears. For those who prefer flower gardens, the long hours of northern sunshine encourage bursts of colour to show up fairly early in the season. 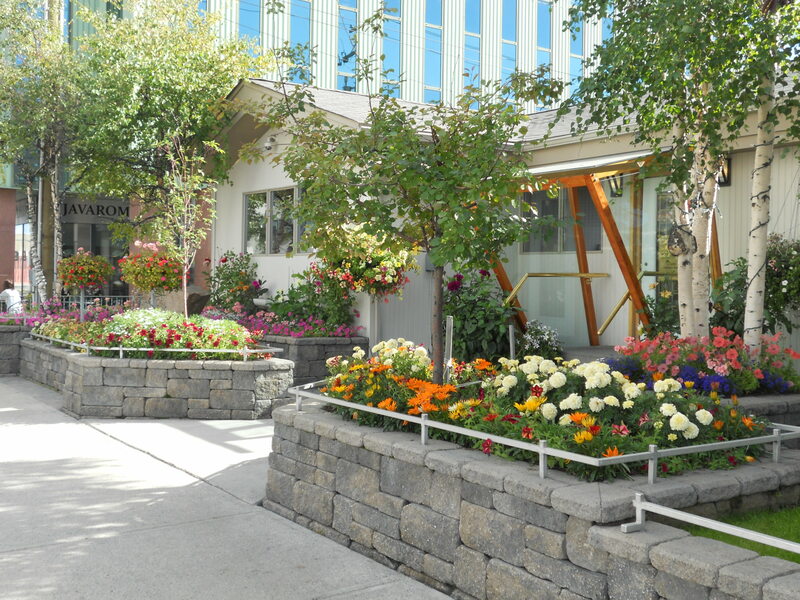 Adam Dental Clinic has by far the best garden of all of the dental offices, and one of the nicest in town. Their display of Christmas lights is equally eye-catching. 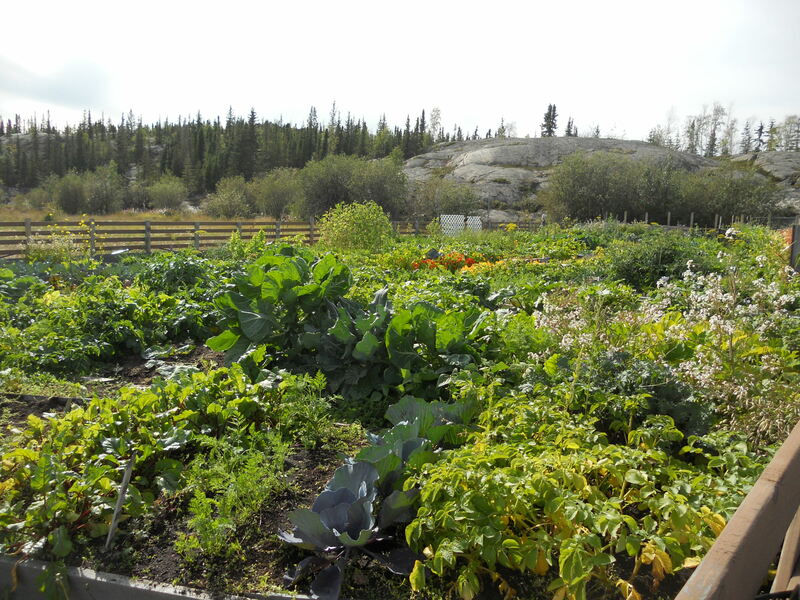 Despite the fact that there’s more rock here than soil in this town, many Yellowknifers have green thumbs. There’s a city-wide gardening competition, the judging for which takes place in August. 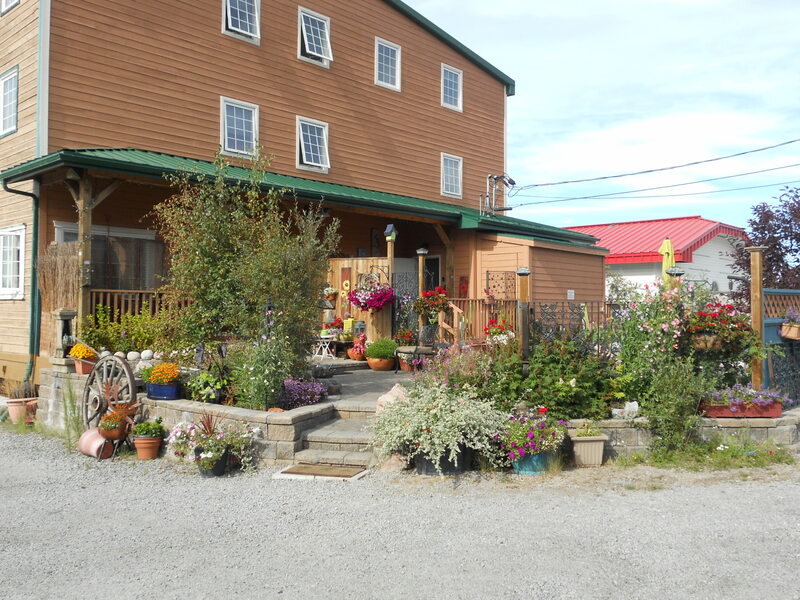 The city encourages residents to vote for the best entries and there are some gardeners who win a prize year after year. Other green thumbs are already preparing for next summer. Tommy Forrest ballpark, more dirt than grass, is getting a much-needed makeover. It has always struck me as a place where you would surely skin your knees if you were to slide or dive to make a catch. 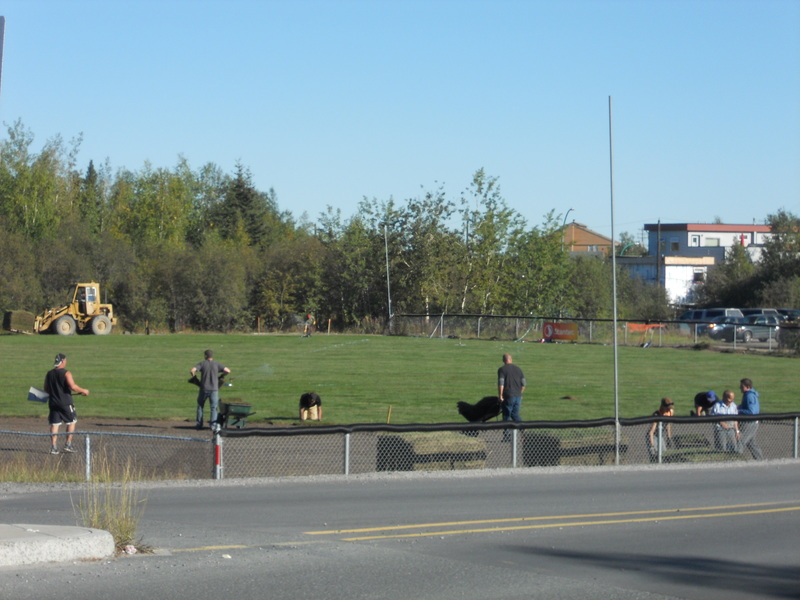 This month, the fastpitch season ended early, to allow time for grass to be laid in the outfield for next season. I passed by on the last weekend of August and saw sprinklers running and fastpitch players working hard, the job almost finished. The field now looks lush and a thousand times more inviting (and skin-preserving) than before. It’s not only the gardens and ballparks that are spruced up. At the annual Ramble & Ride event, which takes place in Old Town over the August long weekend, local artists create a variety of street art. They have a knack for making the plainest of objects more interesting. 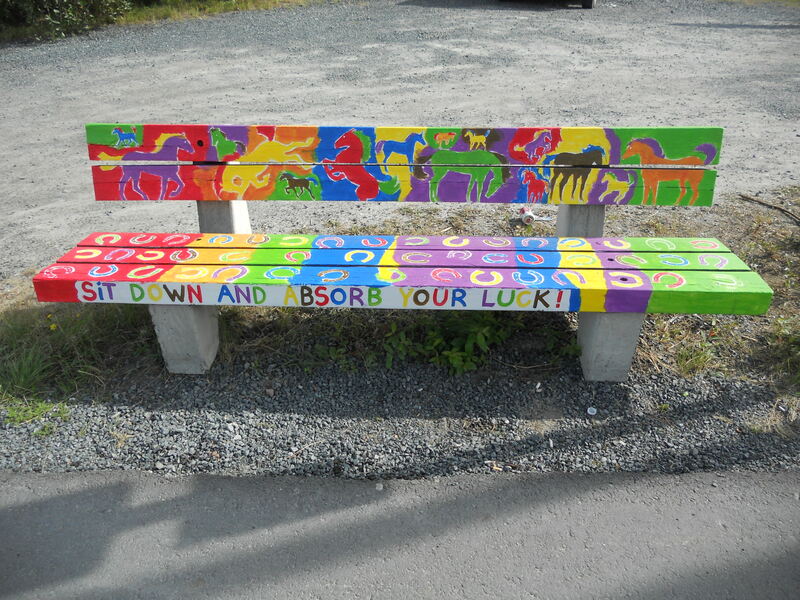 The old bench that you barely notice becomes a noticeably lucky bench. 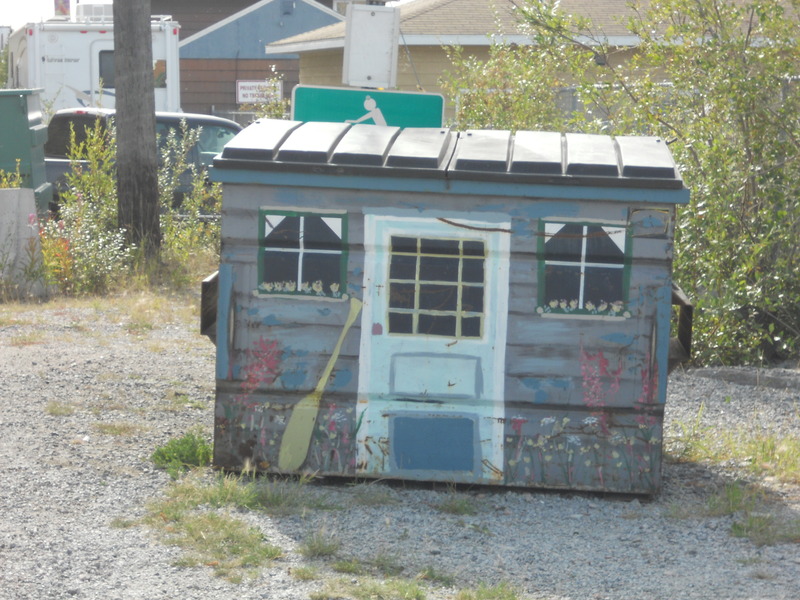 The dreary dumpster sitting by the side of the road becomes something to look at, this one a miniature house, for an imaginary miniature canoeist. 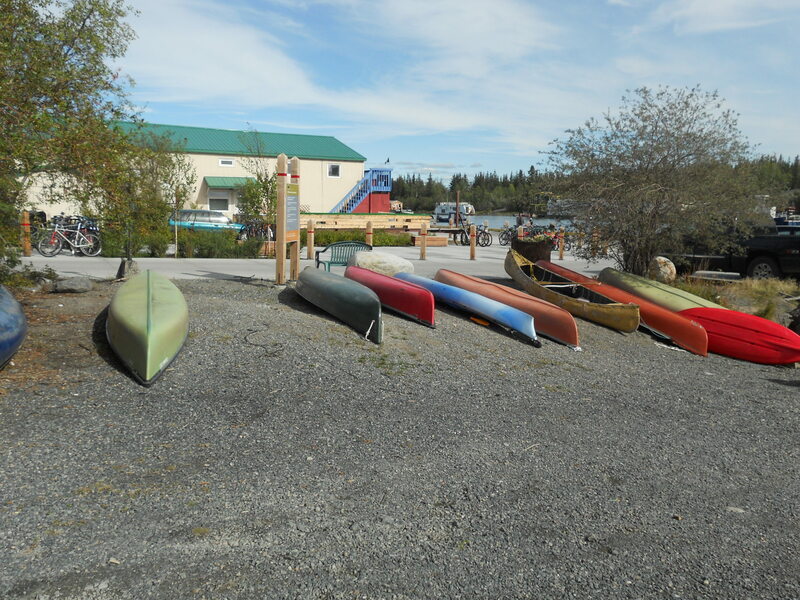 Yellowknife’s sizeable boating community waits impatiently every year for the ice to melt, to take to the glistening waters of the lakes and rivers with craft of all kinds: canoes, kayaks, sailboats, power-boats and even houseboats. Down by the Government Dock in Old Town, there’s parking for both cars and canoes. 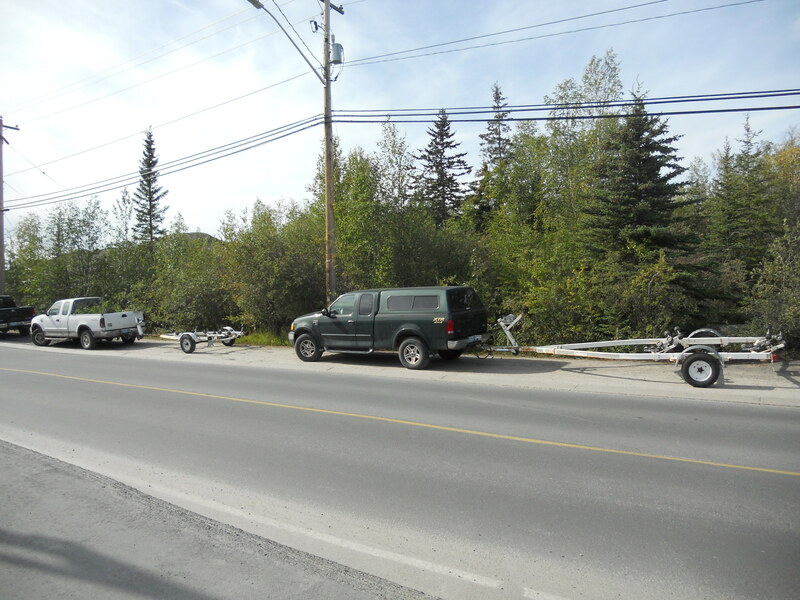 Every weekend, (and during the week) avid boaters line the side of the road approaching the boat launch with their vehicles and boat trailers. The end of August is also when the Annual Old Town Pond Sailors Regatta takes place. 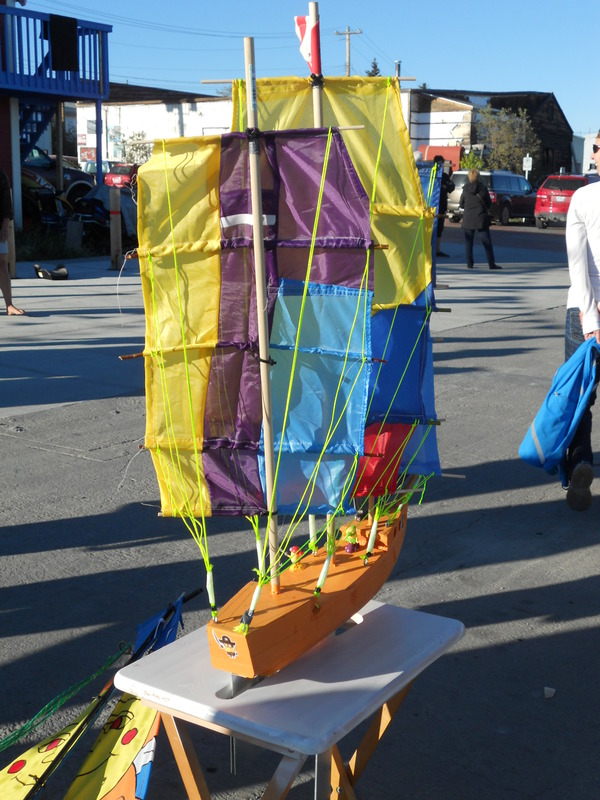 It may sound like a premier-cup race, but it’s a race for toy sailboats. 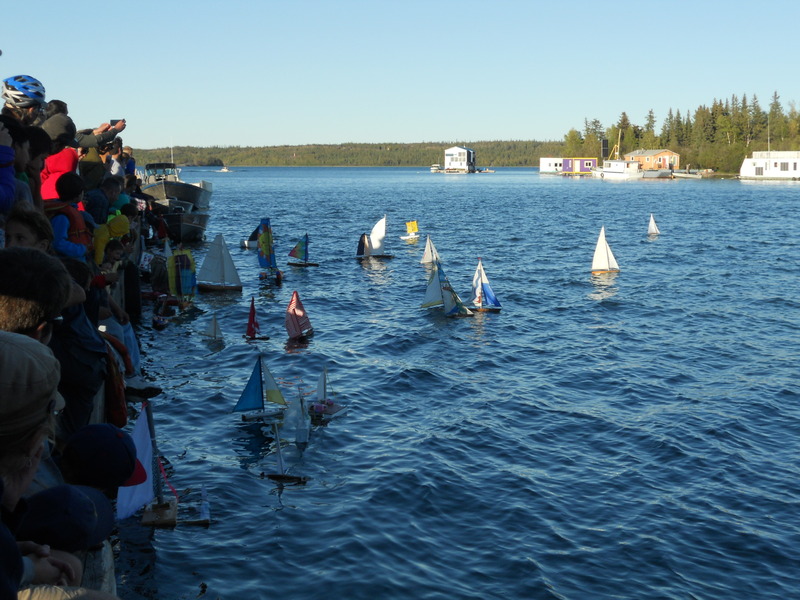 Entrants register their home-made sailboats for a race from the Government Dock across to a floating platform in the bay. There were some colourful and creative entries. Some looked quite upright and sturdy, while others looked as if they would flop over and float like a dead fish in the water. At race time there was a bit of a wind, and coming off the water it was cooler than anybody needed it to be. It required some calculation to figure out the best launch position to ensure that the wind would carry the boat directly over to the platform. 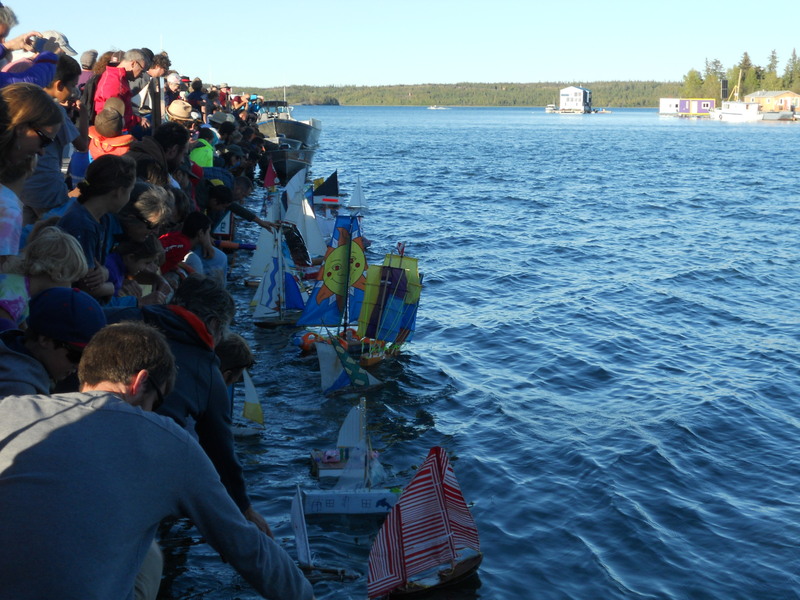 But everyone couldn’t possibly launch from the same spot, so entrants placed their boats in the water and at the start signal, they released them and hoped for the best. Old Town Pond Sailors Regatta – they’re off! Despite the wind, some boats sailed strongly straight across the bay, but not in the direction of the ending platform, unfortunately. Others wandered completely off-course. 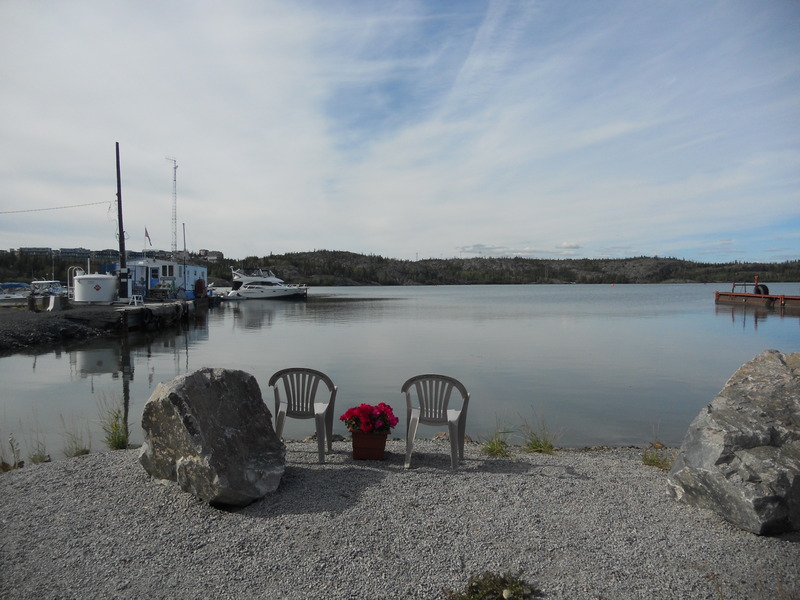 A few bumped into the hull of a boat that was moored on the dock, where they remained bobbing and stuck, as children implored a parent to rescue their boat and get it back into the race. It was rather amusing to watch as the collection of miniature boats charted unpredictable courses, to the alternating glee and chagrin of their creators­. One red sailboat eventually made it over to the ending platform and was declared the winner. School has already started for some children, so their summer has effectively ended. But the summer sunsets are still with us, and they are often spectacular. Even on a grey day the sky can look like an artist’s canvas. If at no other time, at the end of summer it’s worth sitting and watching the sky change, especially if you can do it near to the water. A summer sunset is the best compensation for the end of a fantastic season.